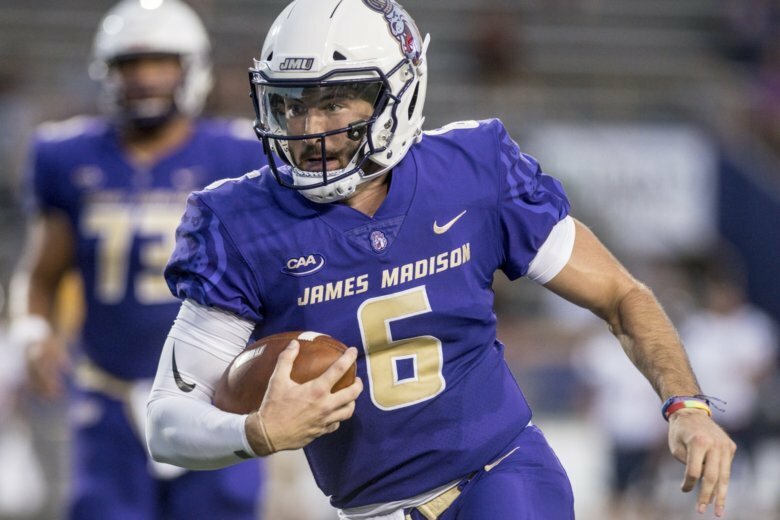 HARRISONBURG, Va. (AP) — Ben DiNucci accounted for a career-high five touchdowns and James Madison eased by Robert Morris 73-7 on Thursday night in a game played early because of Hurricane Florence. James Madison (2-1), ranked No. 2 in the FCS coaches’ poll, tied a program record with 52 points in the first half. Marcus Marshall went in motion and took a short pass 39 yards to open the scoring. DiNucci made it 14-0 on a short sneak after Cardon Johnson highlighted the drive with a 21-yard run. DiNucci found Kyndel Dean wide open in the back of the end zone for a 15-yard score and a 21-0 first-quarter lead. DiNucci’s 17-yard scramble made it 28-0 and he threw an 8-yarder to Riley Stapleton on their next possession. Jimmy Moreland became James Madison’s career leader with 15 interceptions on a second-quarter pick-6 and Percy Agyei-Obese scored with 24 seconds left before halftime for a 52-0 lead. DiNucci was 14-of-17 passing for 184 yards and three touchdowns, and he carried it seven times for 39 yards and two scores. Robert Morris (1-2) was outgained 391-82 in the first half and 667-223 overall.